Unusual sounds from surprising sources. 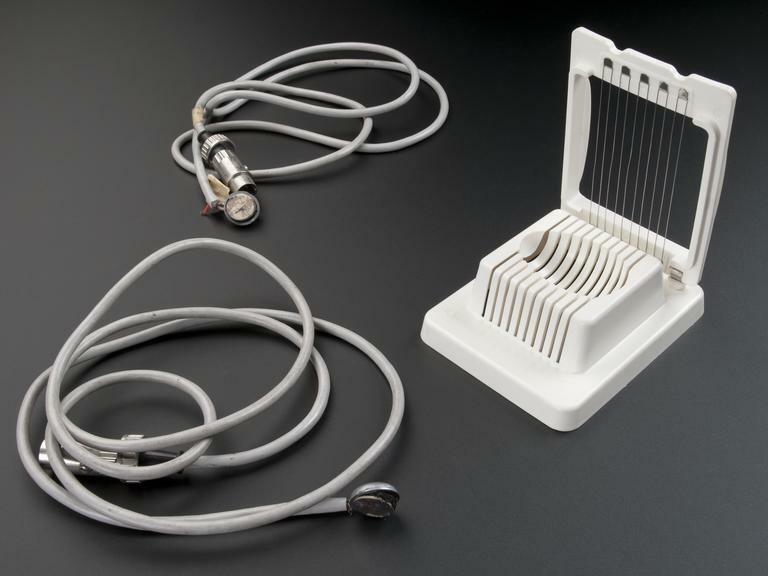 While most of the musical sounds heard today in performance are generated through highly standardised instruments, the variety of objects that can be used to play music is immensely greater, and only partially explored. Our survey of British collections highlighted a number of unexpected objects, some of them surprising because of their material, size, performance technique, sound, or because their primary use is very different. The musical saw is at once familiar and strange; while almost everyone has seen a carpenter's saw, most people aren't aware that it can be played like a violin! The musical saw is played by drawing a violin bow along the edge of the saw's blade (the side without the teeth) as if it were a string. Flexing the saw changes the pitch, which has a constant glissando, sliding from note to note. 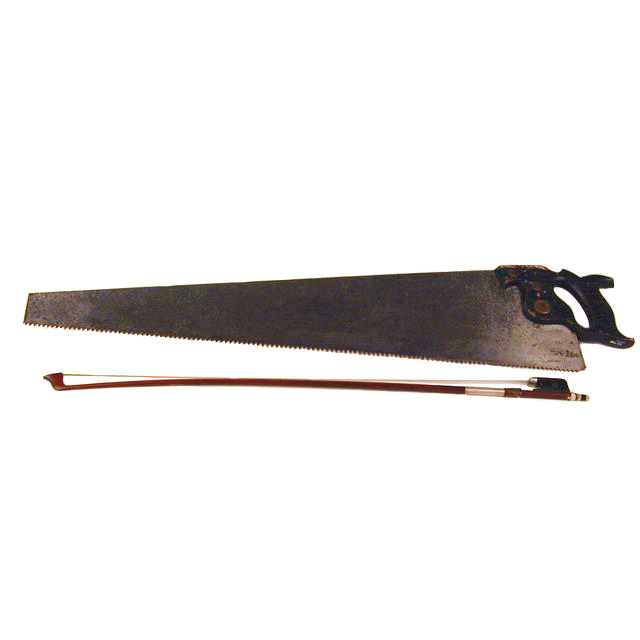 Although specialised saws for use as musical instruments are made, many saw players use an ordinary saw from the hardware store. The musical stones of Skiddaw are a group of musical instruments that were created from rocks over a period of some 60 years in the late 18th and early 19th centuries. 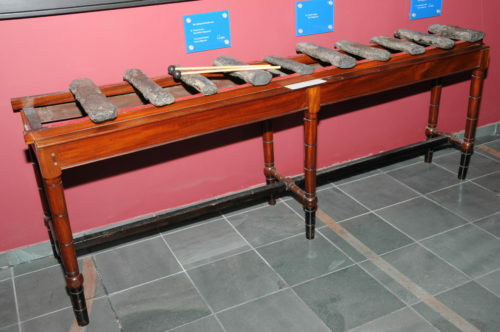 The instruments, more properly known as lithophones (from the ancient Greek lithos, meaning stone), are made from a local variety of hornfels stone - said to be particularly resonant - which are shaped and tuned like the bars of a wooden xylophone. The largest of these instruments has a range of over 8 octaves, greater than the range of modern grand piano. Queen Victoria attended a concert featuring the instrument in the 1840s. The Musical Stones of Skiddaw, in the Ruskin Museum collection. Any flute needs a stream of air to create sound, but there is nothing that dictates that that air has to come from the player?s mouth! Many types of cylindrical flutes, especially examples found in Micronesia, are played through the nose. It is said that in some Polynesian cultures, nose flute players were able simultaneously to play the instrument and chant or sing. Although they work on the same principle, European nose flutes look very different from their Pacific counterparts, typically looking somewhat like a miniature hockey mask covering the nose and mouth. These nose flutes were typically sold as cheap novelty instruments intended for children. A nose flute from Tahiti, from the Saffron Walden Museum collection. Steel drums, also known as steel pans, were first created in Trinidad in the years following the Second World War. Since then, the instrument's bright metallic tones have become one of the best known musical sounds of the Caribbean. Steel drums get their name from the fact that they are traditionally made from 55 gallon metal drums used as containers for oil and other chemicals, which are then cut down in size and tuned to produce musical pitches. Steel drums, from the Horniman Museum collection. Sometimes all it takes for an object to become a musical instrument is to simply think of it as one. A case in point is this egg slicer; while most often thought of as a useful tool for making egg salad, its tiny cutting wires can be strummed by the inventive musician, in this case the electro-acoustic musician Hugh Davies, and transform the kitchen utensil into a musical instrument that can be used in actual performances. 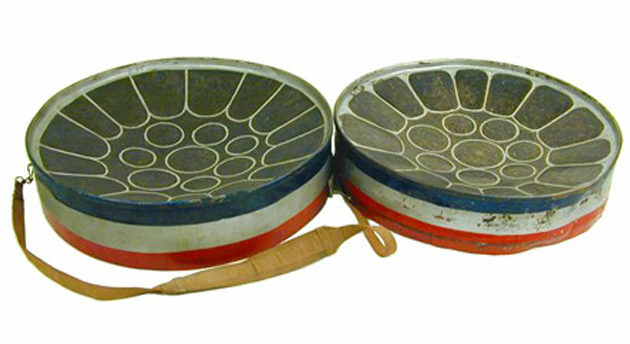 ‘Egg slicer’ instrument from the Science Museum collections. The tromba marina is a bowed string instrument, popular in the 300 years before 1800, that appears to break all the rules. Most bowed stringed instruments are bowed close to the bridge at the bottom of the instrument and fingered at the other end of the string near the nut. The tromba marina works in the opposite way. In addition, its bridge was designed with an intentionally wobbly foot which made a buzzing sound when the instrument was played. The name tromba marina literally means 'marine trumpet', but nobody is entirely sure why, since it's not a trumpet, nor does it have any obvious connection with the ocean. Marine trumpet from the Royal College of Music Museum. The viola d'amore is a bowed stringed instrument popular in the 18th century with a mystery in its moniker. 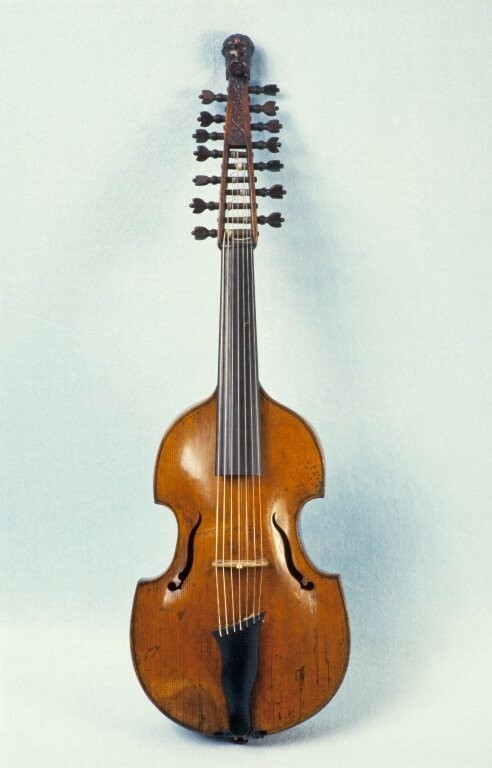 The name is Italian for 'viol of love', and while the viola d'amore is most definitely strongly related to the viol, conflicting theories exist about its name. Its most unusual characteristic is a number of 'sympathetic strings' which run underneath the fingerboard of the instrument. The strings are not played directly, but resonate when the main strings are bowed, creating a rich reverberation in the instrument. Viola d’amore from the University of Edinburgh collections. The theremin is one of the very few instruments that is played without actually touching it; the pitch and volume is controlled by the player by moving their hands nearer and further away from a set of antennas. It was invented in 1922 by the Russian Lev Sergeyevich Termen, better known in the West as Leon Theremin. Theremin created his instrument almost by accident while building a high frequency oscillator as a device for measuring the electrical insulating properties of gases. While trying to improve the device by adding an audio tone, he discovered that the pitch would change when he moved his hand near it. Even if you've never seen a theremin, you?ve almost certainly heard one: they have been famously used in many horror and science-fiction films to create an eerie atmosphere. 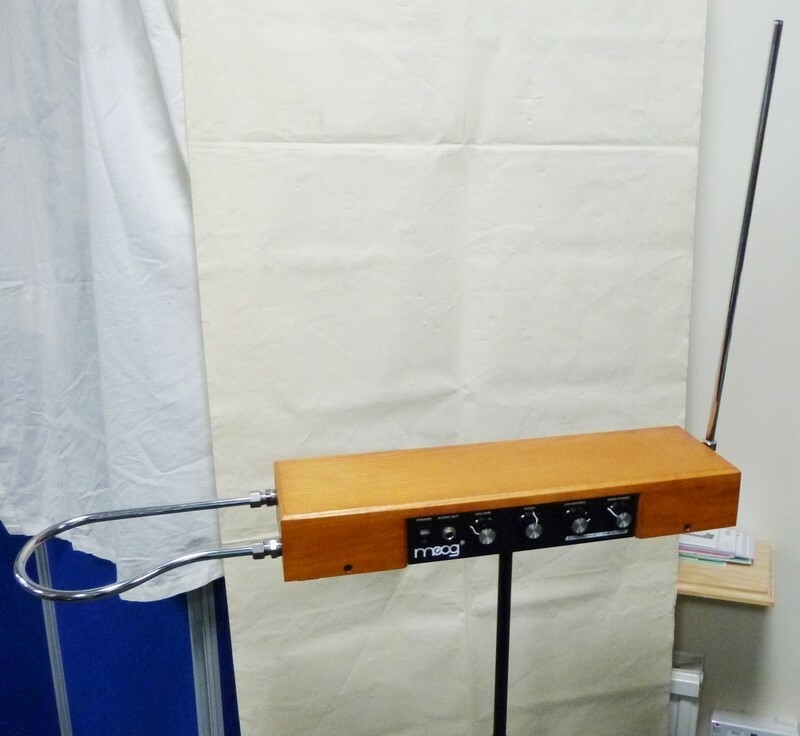 A modern theremin, from the Bate Collection, University of Oxford. This car spring is another good example of an object being repurposed as a musical instrument. 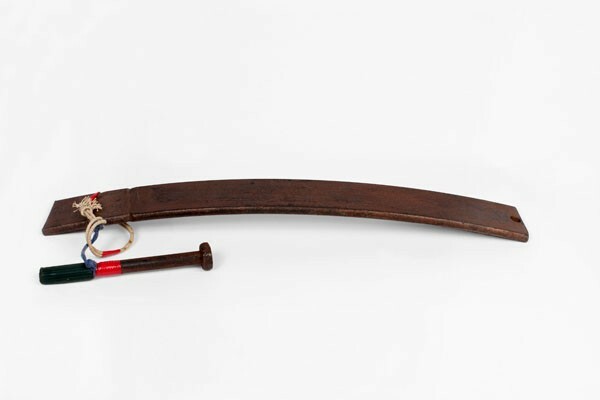 This instrument is part of a car?s leaf spring and is played by striking it with a metal bolt. It was used in the original performances of Benjamin Britten?s The Burning Fiery Furnace, which premiered in 1966. But lest you think that this is somehow not a real musical instrument but simply a common piece of junk, please note that this particular car spring was taken from a Rolls-Royce. Car spring with beater, used by percussionist James Blades, from the Royal Academy of Music Museum.